Guest post written for Eduspire by Theresa Bartholomew, modern librarian, tech enthusiast, and level 2 Google Certified Educator. Many of today’s librarians are integral to school technology initiatives, responsible for co-teaching, curriculum development, administration, managing digital resources, and more. 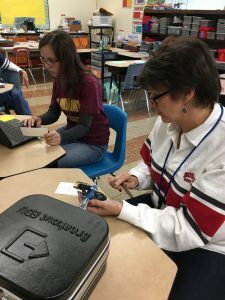 In Part II of this post, Theresa provides a glimpse into the various tech tools used at Warrior Run Middle School in Turbotville, PA, and how she uses them with her students. In part I of this post, we talked a lot about why technology and school libraries go together so well. The library is not all tech, though. We have 14,000 print books available to the students. While I recognize the importance of print books in my library (and, truthfully, my students prefer a printed book to a digital one), it is important to note that they also recognize the convenience of having books available on-the-go via their mobile devices. That is why my library is a member of the PA eBook Consortium, where we receive special discount pricing to be a member and share eBook access through MackinVIA. Mackin is a great company that helps librarians manage their digital resources. We use Follett Destiny as our online catalog. We also tied this to our databases, so that kids can have access with a single login, a feature called One Search. Since students would need to learn how to use this feature, I created a screencast that shows how to use it. I shared this with all of the teachers in my building, and they shared it with the students. We use this feature when doing research projects. In addition to tech integration and testing, makerspaces, project-based learning, and managing digital resources, a typical day for me also includes teaching a class. During the 5th grade specials time, I teach a class on digital citizenship. I work with students on becoming fluent users of the Chromebook for their education and safety, including typing skills, internet safety, social media safety, cyber-bullying, Web 2.0 tools, Google Drive, and more. While I only have 23 days with the students, we make a lot of progress on their abilities — with students creating screencasts where they share their ideas to improve their school with new programs, or showing what they learned in their core classes by using Web 2.0 tools. Students think they love the class because they get to use the computers, but really they love the class because it’s student-driven, collaborative, and project-based. Check out their “I Can” statements here. Also check out Common Sense Media’s digital citizenship resources. We also use resources through PowerLibrary and our local public library. The director of our local public library has been our partner in library promotion for several years now, working together to provide resources and information to the community. With the makerspace being such a hit, it will be growing next year. Moving out of the library space, it’s taking over the computer lab (which, in the age of mobile tech, has become obsolete) and converting into an Innovation Lab. This is very exciting new for our district, as we focus more on authentic, personalized learning and project-based education. The plan for the makerspace can be found here and it includes collaborative and flexible furniture, a green screen and video editing equipment, a wall of supplies, a whiteboard for brainstorming, and a smartboard. The digital resources like K’nex, Stikbots, Sphero robots, Keva Planks, LittleBits, and Snap Circuits I talked about in Part I will all move to this space as well, which will allow for the makerspace to grow and become its own entity. The librarian still maintains a lot of control and say in what goes on in this space, making recommendations for purchases and lesson planning, but it’s a true collaboration with the technology department now, which is really exciting. Our technology coordinator is a former teacher, so he’s been very helpful in implementing meaningful technology in our district. An average day in my life can start by working with my tech sharks, continuing to teach about a tech tool to a class that I have co-planned with a teacher, working with my class on digital citizenship during specials time, then wrapping up the school day with opening the library for getting new books, working on homework, and makerspace time. After school I may share a new idea to my building teachers, getting feedback from them and ultimately deciding who to see the next day during their plan. It’s tiring but extremely rewarding work, knowing that you are having a positive impact throughout the school building.